This article appeared as an introduction to the comparison chart on Breast Tomosynthesis in the March 2016 issue. The digital breast tomosynthesis (DBT) market continues to evolve, with reportedly no less than six new systems prepping to hit the market in the near future. At the 2015 Radiological Society of North America (RSNA) annual meeting, Liane Philpotts, M.D., professor of diagnostic radiology and chief of breast imaging at Yale University, discussed how tomosynthesis is revolutionizing breast imaging. Her presentation touched on how evidence to date reveals consistent reductions in false positives and increases in invasive cancer detection in screening mammography, which should have a profound effect on shifting the balance of benefits and harms of screening mammography. Tomosynthesis has had a dramatic effect on diagnostic mammography, resulting in expedited imaging, fewer patients requiring follow-up and an increase in the positive predictive value of biopsy recommendations. Philpotts stated that benefits of DBT include lowering recall rates and increased cancer detection. “What can we do with this tool? Characterize and localize lesions better,” she stressed. “The literature on screening is very sound and plentiful, and goes beyond just seeing results in diagnostic settings.” She went on to say that DBT could have a profound effect on workflow, which the industry continues to see through technology and innovation. DBT is defined as multiple low-dose full-field projection images of the breast obtained from different angles that form an arc. The images are then used to reconstruct a 3-D image of the breast, resulting in a clearer view without the distraction of overlapping tissue. Currently, there are three tomosynthesis systems on the market. Hologic’s Selenia Dimensions mammography system offers earlier detection of breast cancers, clearer lesion images and reduction in the number of unnecessary biopsies, minimizing patient anxiety and unnecessary costs. GE’s SenoClaire 3-D breast tomosynthesis offers clarity at a low dose using a short X-ray sweep around the compressed breast with only nine exposures. And most recently, Siemens received U.S. Food and Drug Administration (FDA) approval for its Mammomat Inspiration with Tomosynthesis Option, a breast tomosynthesis add-on for its Mammomat Inspiration digital mammography platform. The premise of the technology is that it shoots multiple images and creates a 3-D dataset that produces multiple slices, between 40-140, at 2 mm each, that can be rolled through and looked at in different sections. Hologic has always been a strong player in the digital mammography market and further elevated its presence when it received FDA approval for its Selenia Dimensions Tomo system in 2011. At the time, Hologic was the only vendor to offer DBT technology. According to data from MD Buyline, U.S. facilities, having seen the success of DBT on an international level, were eager to begin using Hologic’s Genius 3-D technology and quickly started adding this to their portfolio of exam offerings. Although improvements in patient care played a factor in the decision to transition from 2-D to 3-D, providers also capitalized on DBT as a marketing tool to show patients they offer the most cutting-edge technology. Hologic continued to make improvements to its technology with the introduction of the Selenia Dimensions Tomo. One of the most notable advancements is C-View, a synthesized 2-D image that eliminates the need to acquire both 2-D and 3-D images. C-View allows for a shorter exam, which reduces the time a patient is under compression, and lowers radiation dose. GE received FDA approval for its digital breast tomosynthesis product, SenoClaire, in August 2014. Unlike Hologic’s tomosynthesis solution, which is only available on its newest Selenia Dimensions platform, GE designed SenoClaire as an option for its existing Senographe Essential and Senographe Care platforms. In April 2015, Siemens received FDA approval for its True Breast Tomosynthesis. As with GE’s solution, Siemens also designed its system as an upgrade to its existing Mammomat Inspiration and Mammomat Inspiration Prime platforms. Its breast tomosynthesis algorithm reconstructs 25 2-D images of the breast into an approximation of a 3-D image to enable detection of tumors that are hidden by overlapping breast tissue. In tomosynthesis mode, the X-ray tube of the Mammomat Inspiration rotates in a circular motion around the breast to acquire an image every 2 degrees while moving through an angular range of 50 degrees. Fujifilm Medical Systems recently submitted to the FDA the first module of its premarket approval (PMA) application for DBT. The module will be offered as an optional upgrade for the Aspire Cristalle mammography system. Fujifilm plans to file the remaining modules of DBT PMA within the coming year. The optional DBT upgrade for the Aspire Cristalle system, known as Amulet Innovality outside the United States, has been available since May 2013 in Europe, Asia and Latin America. Aspire Cristalle features Fujifilm’s hexagonal close pattern (HCP) detector pixel design, engineered for higher acquisition efficiency and to enhance detail for improved low-dose performance compared to conventional square pixel design. The result is sharper images with gentler dose to the patient. Volpara Solutions has received a new 510(k) clearance from the FDA for Volpara Density Maps. The solution is designed to help radiologists address the requirement in the Breast Imaging Reporting and Data System (BI-RADS) 5th Edition Atlas to provide “an overall assessment of the volume of attenuating tissues in the breast, to help indicate the relative possibility that a lesion could be obscured.” The maps present the 3-D quantitative volumetric information created by the VolparaDensity algorithm in a 2-D image that is available as an additional DICOM secondary capture image. Going beyond the measurement of the area of dense fibroglandular tissue, VolparaDensity measures the compressed thickness and volume of dense tissue, which enables the software to highlight specific parts of the breast tissue that are especially dense, including marking the densest 1-2 cm region of the image that might warrant closer inspection due to the masking risk. Eizo Inc. has received FDA 510(k) clearance for breast tomosynthesis on its 5-megapixel monochrome medical monitor, the RadiForce GX540. The FDA 510(k) clearance includes tomosynthesis, mammography and general radiography. The monitor’s high resolution makes it ideal for viewing the fine details in breast images. Intelerad Medical Systems released the Technologist Portal at RSNA 2015. Integrated directly into IntelePACS and InteleOne XE, the solution facilitates case assignment to technologists and allows them to add the information required to fill orders. For breast imaging, the latest release features a number of enhancements to Intelerad’s Tomosynthesis Module, such as the ability to automatically stack through slices, adjust stacking direction and speed, and improve navigation through studies via enhanced sequence protocols. 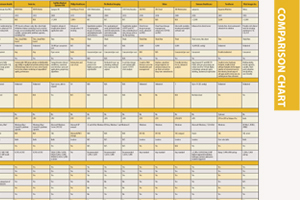 This article served as an introduction for a comparison chart of technical specifications for breast tomosynthesis imaging systems available on the U.S. market. To access the chart, go to www.itnonline.com/content/breast-tomosynthesis-systems. This will require a login, which is free and only takes a minute to complete.